The Baltimore-Washington area is possessed of a rich architectural history and affords great photographic opportunities, being home to such beautiful and historic buildings, sculpture, etc..Yet there is much beauty and nostalgia in everyday buildings and structures and streetscapes. I think that Elbe's Beer and Wine in Wheaton as well as The Golden Bull in Adelphi are worth of a closer look..
Born in Kent Ohio in 1960 and shortly there after moved to Bedford Ohio (a suburb of Cleveland), only to relocate to the Washington DC metro area in the summer of 1967. Aside from brief relocations to Baton Rogue Louisiana and Fairfax Virginia, have resided in the DC metro area and including Germantown Maryland, downtown Frederick Maryland, downtown Silver Spring Maryland, and the Dupont and Thomas Circle neighborhoods of downtown Washington DC. It's an old debate, the question weather life imitates art or art imitates life, but in regard to this web site it's readily apparent that art depicts life. The Home /Index page features a series of screenshots and accompanying links to various sections and pages of the website and serves as a central directory as well as the Home page. The Photo-Art page showcases fine art photographic endeavors and is a compendium of original photographs for sale. The Print/Mixed Media Art page demonstrates original print graphics and mixed media fine art of various types. The Photos page links to photographs of various cities and neighborhoods, buildings and other structures as well as of life abroad and nature in general. 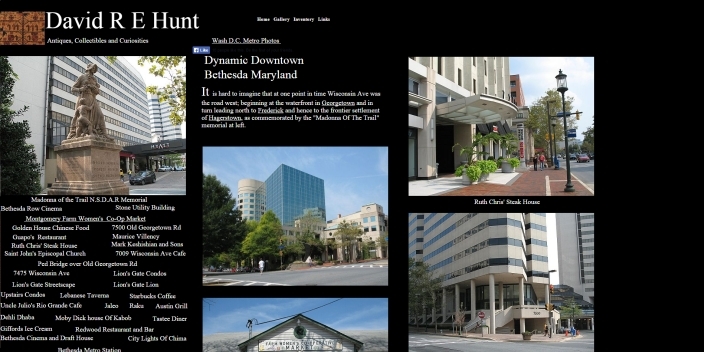 The bulk of the site's content is to be found on the photo pages. 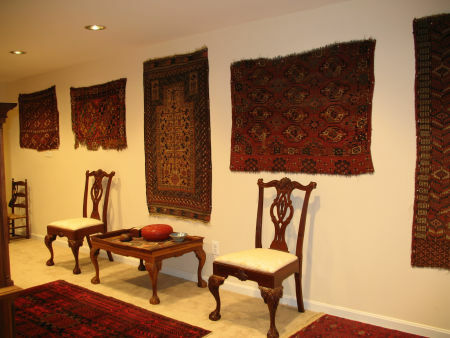 The Textiles page- Photographs of my oriental carpet and textile collection. The Projects page documents various projects which I have undertaken over the years, including the restoration of a log cabin, stripping and refinishing of antique chairs and the preservation of a Pennsylvania German dower chest. 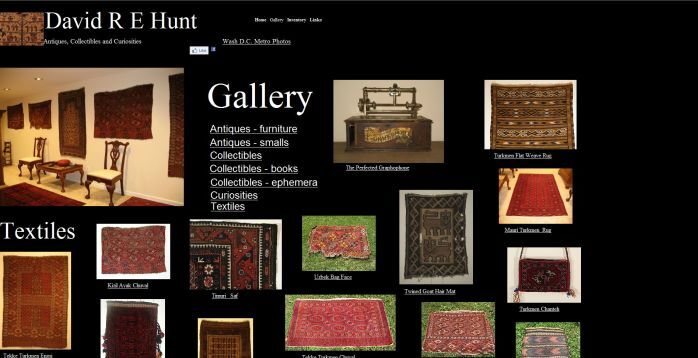 The Gallery page - objects from my collection, which include collectible textiles, antique furniture of various styles and periods, ethnographic artifacts, works of art, and some rather curious objects. 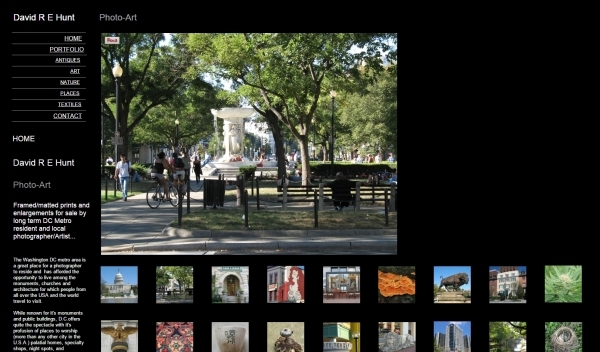 The Inventory page lists photographic and web services. The decision was made to matriculate as a Liberal Arts major as opposed to a Fine Arts major, and have always wondered how things would have differed had the Arts major been pursued. A skilled tradesman is an artist of sorts and have found that many of the skills and procedures utilized in the realization of trade craft inform the process and execution of Arts, thus have found experience as a tradesman invaluable as an artist. The majority of these works were executed during formative years and early adulthood. The line drawings constitute the main body of work and date from a secondary school and early college period, roughly 1976 - 1981. Many of these pencil/ball pen drawings were spontaneous, executed upon whatever was at hand, be it drawing paper, yellow legal pad or lined loose leaf binder paper. In the majority are these surreal interpretations of various objects and scenes of nature informed by personal psychonautic experiences. The graphics date from the years 1984 - 1986 and were drawn upon acetate sheet with India Ink and were designed specifically as graphics for hand printed T-shirts and clothing/fabric art. They are intended to be bold and indelible, to arrest and command attention.The primal dichotomous symmetry of the chosen colors, limited to black and white, are of symbolic import. Alpha and Omega, Yin and Yang, beginning and end, black and white, day and night, life and death. 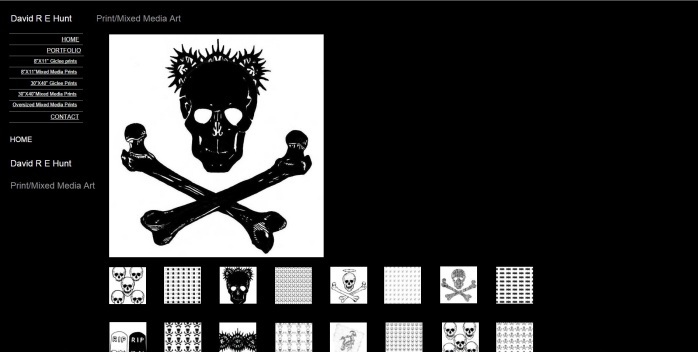 The death's head is an ubiquitous icon, a powerful and meaningful symbol instantly recognizable across all language, custom and cultural barriers. In the west the symbol is endowed with a dark, sinister, shocking and warning/hazard connotation, yet in other cultures and societies it is seen as a positive symbol of life force and rebirth. Buddhist imagery and the Mexican "Sugar Skull" immediately come to mind. Consisting of over 550 pages and more than 7000 photographs and images this website serves as an online Photographic and Arts Portfolio and Resume. Photo-Art - showcases fine art photographic endeavors and is a compendium of original photographs for sale. 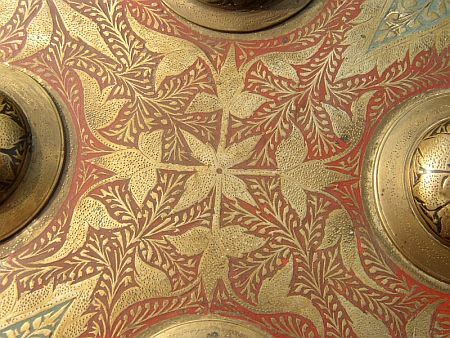 Antiques, Collectibles and Curiosities - which constitutes the bulk of the website is a somewhat convoluted photographic treatment of my various exploits in the fields of antiques and collectibles, including repair and restoration as well as acquisition and evaluation. Please note that I do not make any claim of expertise in regard to the evaluation of the presented objects. One of the primary goals of this website is precisely that of challenging myself to learn more about these objects and of my collecting in general.